As more and more research confirms the effectiveness of cannabis based medications in treating serious life threatening conditions, inevitably there has been an increase in unscrupulous individuals offering untested, poorly made cannabis oil for sale. The Scammers use social networking sites such as Facebook and YouTube to find customers/victims and many of them can appear very plausible, some even claim to be medical professionals. They use words like “cure”, we do not use the word “cure” at Bud Buddies, in relation to cancer we much prefer the word ‘treatment’ to ‘cure’, we feel it is more accurate. If the oil truly was a cure, then a person’s cancer would go into remission and not return but it is obvious that there is a requirement for an ongoing ‘maintenance dose’ (for life) to keep cancer in remission. The scammers often sell low grade or fake cannabis oil, none of their oils will have been laboratory tested. They will often ask for several thousand pounds for their oil, claiming they have successfully treated everything from depression to cancer. Our advice is never to purchase any cannabis oil from these sources. The oil, if it ever arrives, may be of no medical use and the advice given, in many cases is irresponsibly dangerous. Do not fall victim to these individuals who prey on sick and vulnerable people, we exposed some of them in our Project Storm documentary. 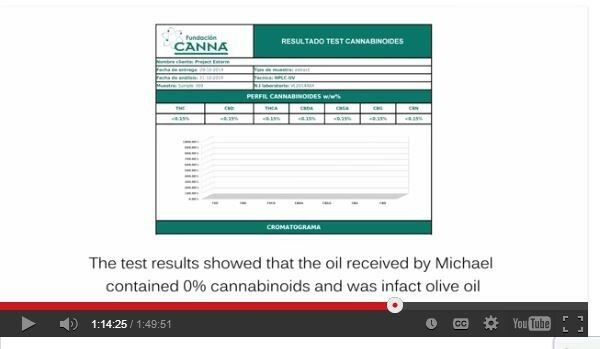 This scammer exposed in Project Storm was advertising CBD oil which he claimed contained 15% CBD, it was actually just olive oil and it was sold to a terminal cancer sufferer. Bud Buddies members are taught to be self-sufficient, this is our “Prime Directive”. We believe that being self-sufficient is the best course of action and therefore the vast majority of our members are cultivating cannabis to treat themselves or a loved one. Don’t trust your life or the life of a loved one to a scammer.